Can neural networks predict trended time series? Yes and… no! First, I should say that I am thinking of the common types of neural networks that are comprised by neurons that use some type of sigmoid transfer function, although the arguments discussed here are applicable to other types of neural networks. Before answering the question, let us first quickly summarise how typical neural networks function. Note that the discussion is done in a time series forecasting context, so some of the arguments here are specific to that and are not relevant to classification tasks! MLPs are a basic form of neural networks. Having a good understanding of these can help one understand most types of neural networks, as typically other types are constructed by adding more connections (such as feedbacks or skip-layer/direct connections). Let us assume that we have three different inputs, (X1, X2, X3), which could be different variables or lags of the target variables. A MLP with a single hidden layer, with 5 hidden nodes and a single output layer can be visualised as in Fig. 1. Fig. 1. MLP with 3 inputs, 5 hidden nodes arranged in a single layer and a single output node. where b0 and a0,i are constants and bi and aj,i are weights for each input Xj and hidden node Hi. Looking carefully at either Eq. 1 or Fig. 1 we can observe that each neuron is a conventional regression that passes through a transfer function f() to become nonlinear. The neural network arranges several such neurons in a network, effectively passing the inputs through multiple (typically) nonlinear regressions and combining the results in the output node. This combination of several nonlinear regressions is what gives a neural network each approximation capabilities. With a sufficient number of nodes it is possible to approximate any function to an arbitrary degree of accuracy. Another interesting effect of this is that neural networks can encode multiple events using single binary dummy variables, as this paper demonstrates. We could add several hidden layers, resulting in a precursor to deep-learning. In principle we could make direct connections from the inputs to layers deeper in the network or the output directly (resulting in nonlinear-linear models) or feedback loops (resulting in recurrent networks). The transfer function f() is typically either the logistic sigmoid or the hyperbolic tangent for regression problems. The output node typically uses a linear transfer function, acting as a conventional linear regression. To really understand how the input values are transformed to the network output, we need to understand how a single neuron functions. the values of the input, weight and constant. The first plot shows the input-output values, the plot of the transfer function and with cyan background the area of values that can be considered by the neuron given selected weight and constant. The second plot provides a view of the neuron function, given the transfer function, weight and constant. Observe that the weight controls the width of the neuron and the constant the location, along the transfer function. What is quite important to note here is that both logistic sigmoid and hyperbolic tangent squash the input between two values and the output cannot increase or decrease indefinitely, as with the linear. Also the combination of weight and constant can result in different forms of nonlinearities or approximate linear behaviours. As a side note, although I do not see MLP as anything to do with simulating biological networks, the sigmoid-type transfer functions are partly inspired by the stimulated or not states of biological neurons. The scale of the inputs is very important for neural networks, as very large or small values result in the same constant output, essentially acting at the bounds of the neuron plots above. Although in theory it is possible to achieve the desired scaling using only appropriate weights and constants, training of networks is aided tremendously by scaling the inputs to a reasonable range, often close to [-1,1]. With sigmoid type transfer functions it is impossible to achieve an ever increasing/decreasing range of outputs. So for example if we were to use as an input a vector (1, 2, 3, 4, 5, 6, …, n) the output would be squashed between [0, 1] or [-1, 1] depending on the transfer function, irrespectively of how large n is. Of course, as Eq. 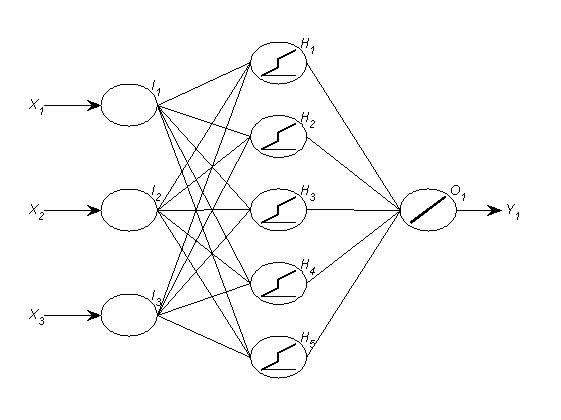 (1) suggests, in a neural network the output of a neuron is multiplied by a weight and shifted by a constant, so it is relatively easy to achieve output values much greater than the bounds of a single neuron. Nonetheless, a network will still “saturate” and reach a minimum/maximum value and cannot decrease/increase perpetually, unless non-squashing neurons are used as well (this is for example a case where direct connections to a linear output become useful). An example of this follows. Suppose we want to predict the future values of a deterministic upward trend with no noise, of the form: yt = xt and xt = (1, 2, 3, 4, …). 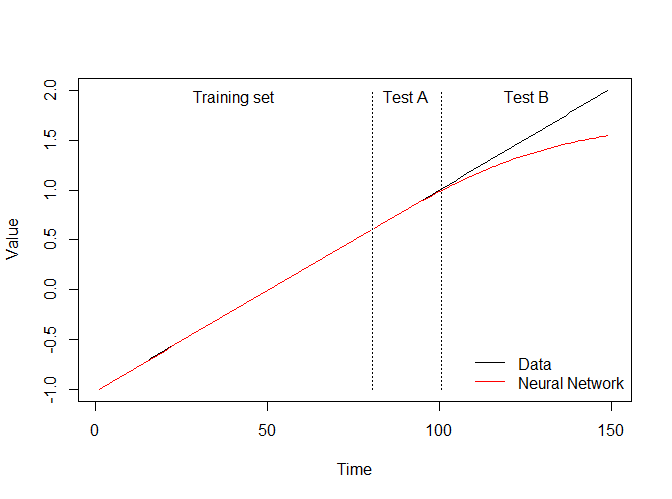 We scale the observed values between [-1, 1] to facilitate the training of the neural network. We use only 80% of the values for training the network and the remaining 20% to test the performance of the forecasts (test set A). We train a network with 5 logistic hidden nodes and a single linear output. Fig. 2 provides the resulting network with the trained weights and constants. Fig. 2. 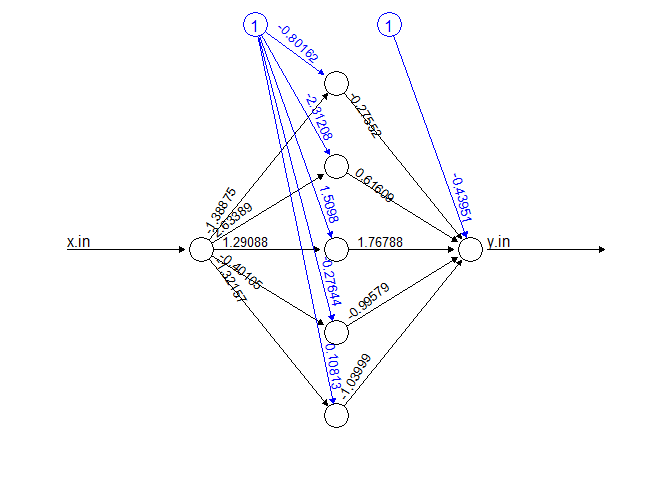 Trained network for predicting deterministic trend. The single input (scaled xt) is fed to all five nodes. Observe that it is multiplied with different weights (black numbers) and shifted by different constants (blue numbers) at each node. When additional inputs are used, the inherent difficulty in interpreting all these weights together, makes neural networks to be considered as black boxes. Fig. 3 provides the observed yt and predicted neural network values. 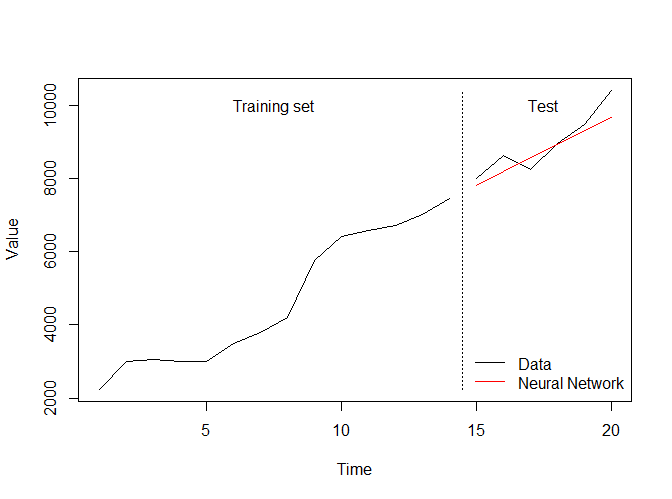 The network is able to provide a very good fit in the training set and for most of test set A, but as the values increase (test set B) we can see that the networks starts to saturate (the individual nodes reach the upper bounds of the values they can output and eventually the whole network) and the predicted trend tapers off. As we saw earlier, each sigmoid-type node has a maximum value it can output. Fig. 3. Actuals and neural network values for the case of deterministic trend with no noise. This raises a significant doubt whether neural networks can forecast trended time series, if they are unable to model such an easy case. One would argue that with careful scaling of data (see good fit in test set A) it is possible to predict trends, but that implies that one knows the range that the future values would be in, to accommodate them with appropriate scaling. This information is typically unknown, especially when the trend is stochastic in nature. Fig. 4. Neural network forecast for a trending yearly M3 competition series. This approach implies a two stage model, where first zt = yt – yt-1 is constructed and then zt is modelled using neural networks. This imposes a set of modelling constraints that may be inappropriate. The neural network is capable of capturing nonlinearities. 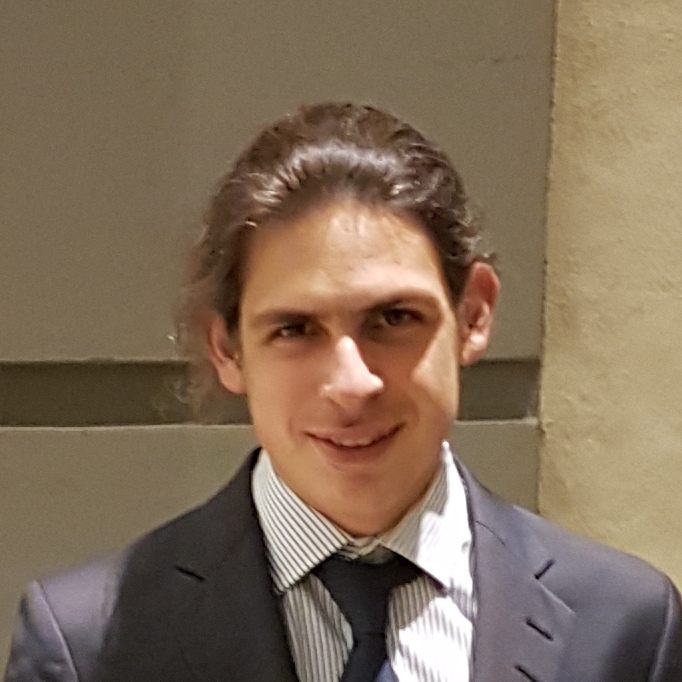 However if such nonlinearities are connected to the level, for example multiplicative seasonality, then by using differences we are making it very difficult for the network to approximate the underlying functional form. Differencing implies stochastic trend, which in principle is inappropriate when dealing with deterministic trend. Therefore, it is fair to say that differencing is useful, but is by no means the only way to deal with trends and surely not always the best option. However, it is useful to understand how sigmoid-type neurons and networks are bound to fail in modelling raw trended time series. There have been several innovations in neural networks for forecasting, but most are bound by this limitation due to the transfer functions used. So, can neural networks forecast trended time series? Fig. 4 suggests yes, but how to best do it is still an open question. Past research that I have been part of has shown that using differences is reliable and effective (for example see the specifications of neural networks here and here), even though there are unresolved problems with differencing. Surely just expecting the network to “learn” to forecasts trends is not enough. I was wondering if you tested other decomposition methods like stl, Empirical Mode Decompostion,…, to extract the trend instead of differencing. Another question is about LSTM neural networks and its posiblities to forecast time series. I was wondering if you tried a decomposition method, like stl, Empirical Mode Decomposition,… to extract a trend instead of using differencing. Another question is about LSTM neural networks and its capacity to forecast time series. Do you have any post about thjis topic.? You could provide it a trend indicator, either by using a dummy variable 1, 2, …, n or by providing the result of a decomposition. In sample that would work well, but out-of-sample it would eventually saturate. As the dummy (or trend) variable values would become very big eventually the neurons would be forced to their extreme values. However, for relatively short term forecasting it would work fine, as the saturation would not manifest (well, it depends on the scaling of the inputs). I have not experimented with LSTM networks, but if I am not mistaken these are a type of recurrent network, which can do more than typical feedforward networks that can be seen as nonlinear ARX methods. Your analysis is quite interesting but you forgot to mention Deep architectures. It is widely accepted that the power to compute and do abstractions grow exponentially with the number of hidden layers, as long as you are able to overcome the fading gradient problem. We are working in corporative project that does real predictions on products sales using a five layers network. Indeed Oscar, and I fully agree with your statement about the increased power of deep networks. However, I have not yet seen a convincing application of deep architectures for time series forecasting, so I would be very interested to learn more about your project!